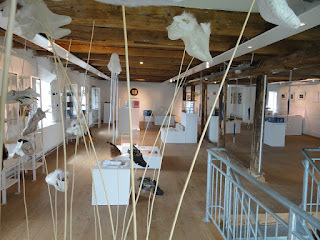 Themed exhibition: ...in the air, 2011. Photo M-SDA. Doverodde Book Arts Festival III took place June 3-5th, 2011 and was, as with previous years, host to several events: an international themed exhibition: …i luften / …in the air, talks, workshops, small happenings and one collected stand area where the artists could show, sell and discuss their work with visitors. 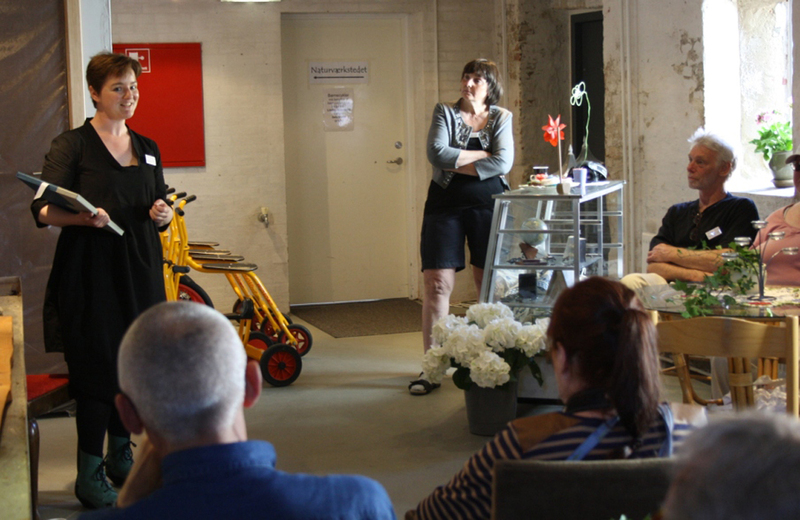 The Tower was for the first time host to a book arts installation and the Doverodde Book Arts Center of Denmark Award was introduced. It was also the year where 90 international artists from Scandinavia, various European countries, USA, Canada, Brazil and Australia contributed with more than 70 pieces of work for the themed exhibition making it the biggest yet. 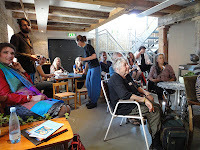 The tradition of the Book Café – designed to the occasion by puppet maker and set designer Lena Hansen – was yet again restored. This year with the theme: granny’s house with bird song. 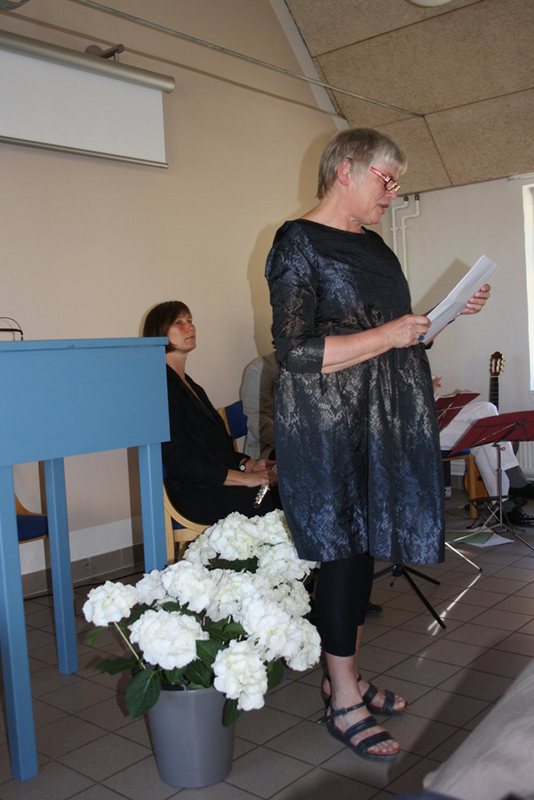 Nina Hobolth during the opening speech, 2011. Photo KEH-J. 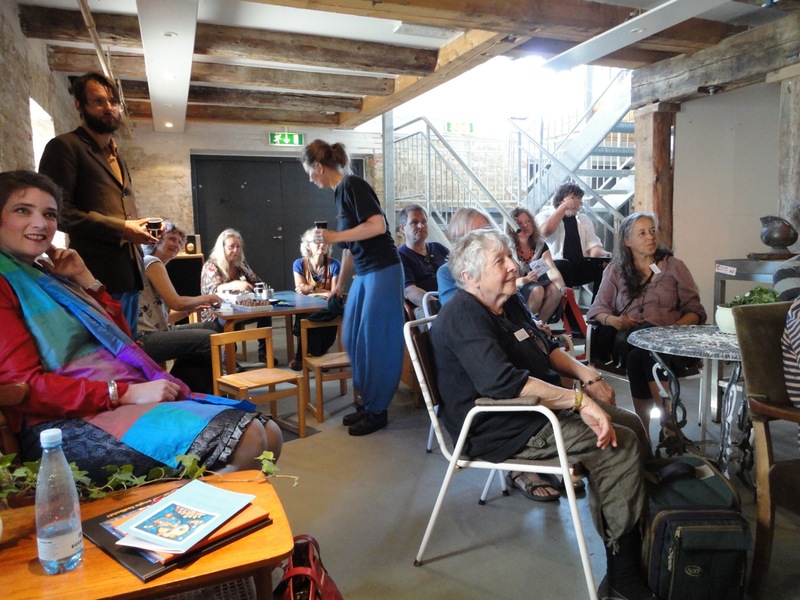 The guest of honour Senior Researcher Nina Hobolth, former Director of Kunsten Museum of Modern Art Aalborg opened the Festival on Friday the 3rd of June accompanied by Music in a Garden, four musicians from Kassel, Germany put together by Regine Brunke. 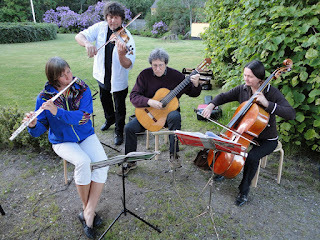 Music in a Garden: (From left) Antje Überscheer, Ingolf Lienau, Norbert Dams and Regine Brunke playing in the garden of the Limfjordscentret during the evening of the dinner-buffet. Photo M-SDA, 2011. German artist Ahlrich van Ohlen who has been participating in the Festival since the beginning in 2009 contributed with two special self initiated projects. 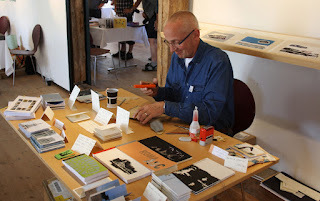 Ahlrich van Ohlen at his stand working. Photo KEH-J, 2011. At the Festival in 2010 he had photographed the shoes of every participant and in the following year leading up to the next Festival everyone would receive postcards from Ahlrich with a small project to do on a postcard, which were to be returned to him. At the opening ceremony Ahlrich presented a big wooden shoe containing the postcards he had received during the past year from 12 international artists – four countries involved. 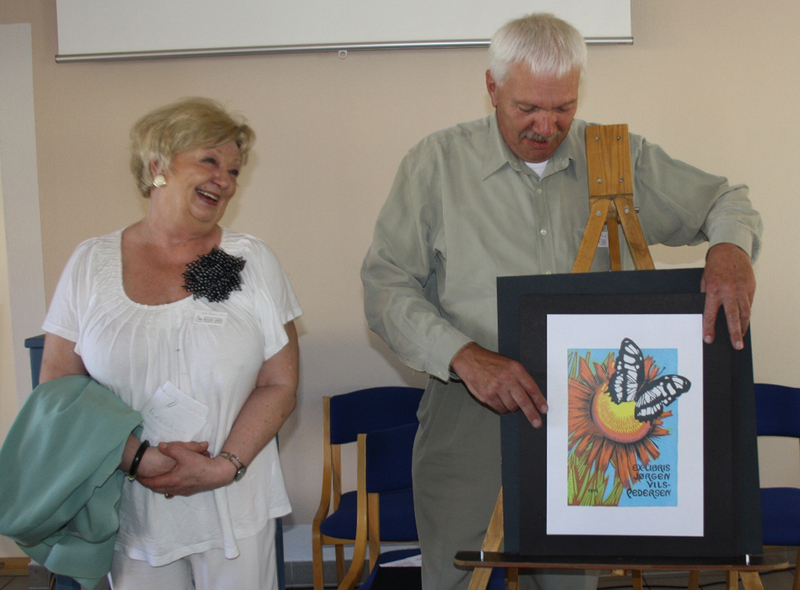 His project had mounted to 66 Mail Art cards, which had been sent between 15 counties containing a wide range of techniques used and ideas presented. 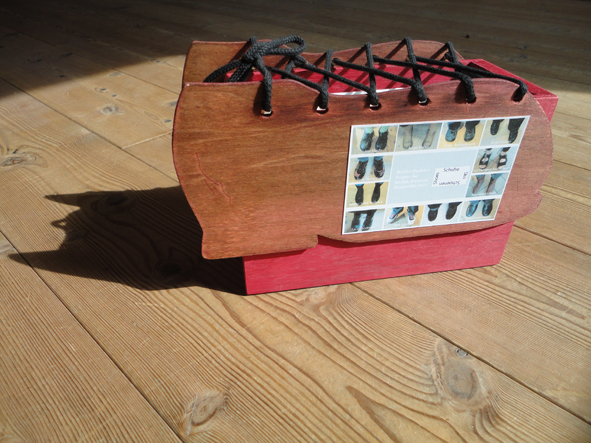 The Shoe was donated to the Doverodde Book Arts Collection. See one of Ahlrich's cards here. Below the Tower on the lawn outside Ahlrich also set up an installation with small poems in 3 languages and images of clouds in the sky on laminated A4 sheets placed on metal pools. They would flap like little wings in the wind during the whole Festival. Watch it here. 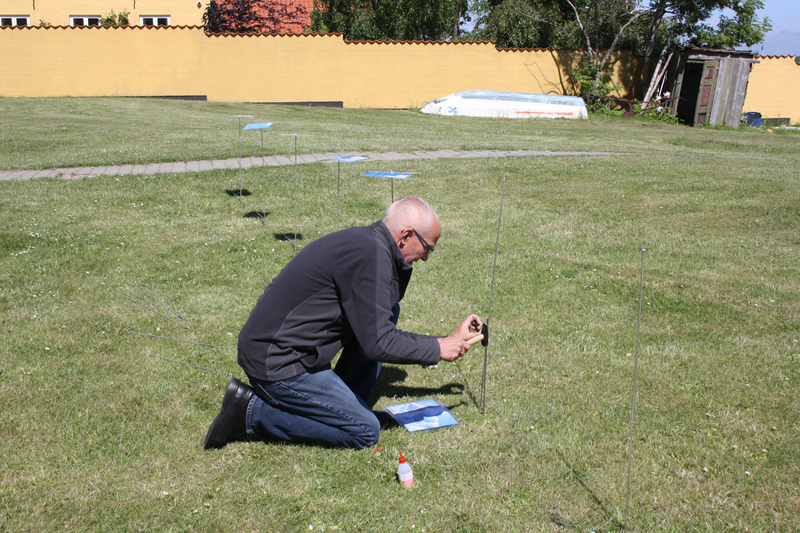 Ahlrich van Ohlen in the process of setting up his installation. Photo KEH-J, 2011. 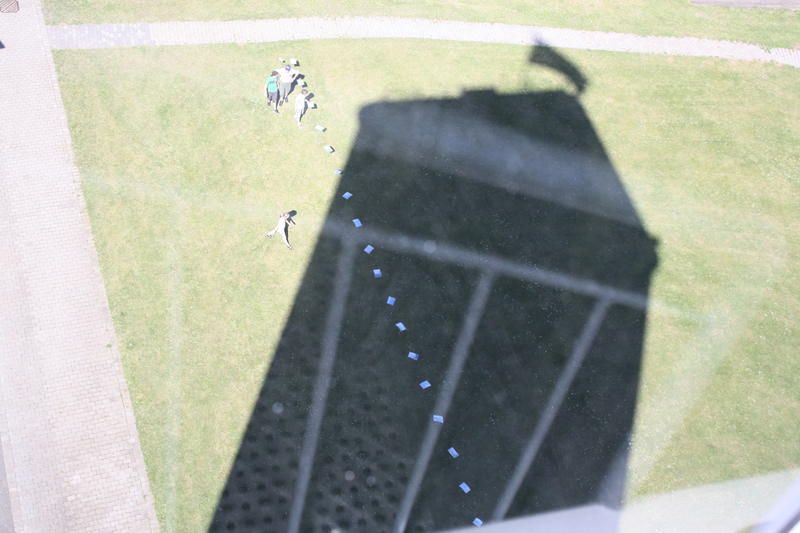 The installation by Ahlrich van Ohlen seen from the top of the Tower. Photo KEH-J, 2011. After the official opening of the Festival on Friday June 3rd Mette-Sofie D. Ambeck opened her installation: They came, they flew at 4pm along with music by German composer and musician Regine Brunke who performed her music piece: Hinter den Farben der Woeken /Behind the colours of the clouds (2008) for viola cello & verrophone (glass tube-instrument). Regine Brunke after her performance in the Tower. Photo M-SDA, 2011. 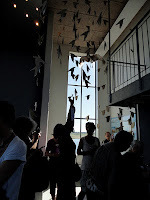 The installation was inspired by Alfred Hitchcock's movie The Birds (1963) and contained 204 hand-cut and stitched birds, of the three common breeds to the area for the time of year: Colóeus monédula (Jackdaw), árus ridibúndus (Black-headed Gull) and the Délichon úrbica (Common House Martin). After 4pm that day any visitor to the 3rd floor of the Tower was welcome to cut down a bird and set it free where ever they pleased (i.e. bringing it home with them). Birds being cut down. Photo M-SDA, 2011. Birds being cut down in the installation. Photo M-SDA, 2011. The installation and the Festival also made it to local tv: Midt/Vest where a few seconds were featured with Mette-Sofie D. Ambeck. See the clip here or below. 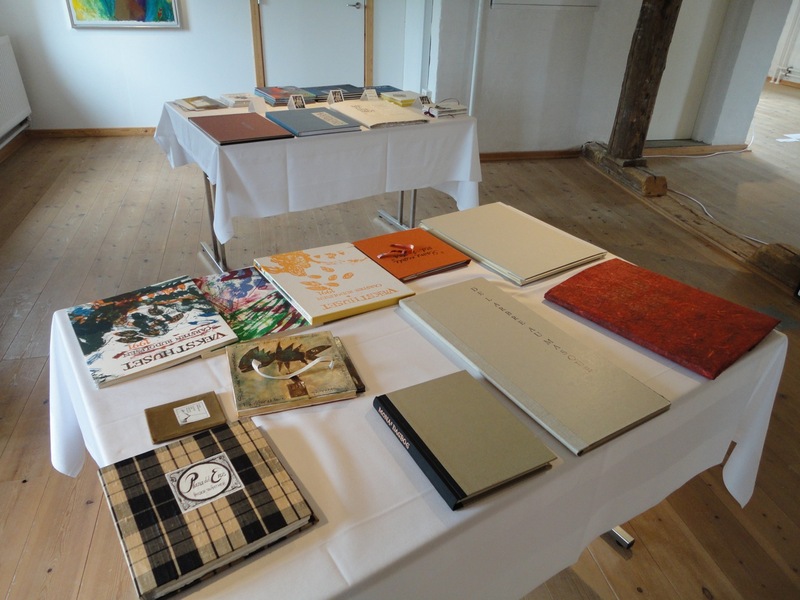 From Frederikshavn Kunstmuseum the Ex Libris Collection came to give a talk about the collection, which is the biggest in Northern Europe. 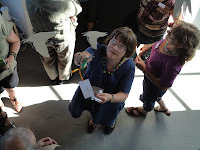 From the 2nd-26th of June a framed collection was to be seen in the upper galleries themed to …in the air. 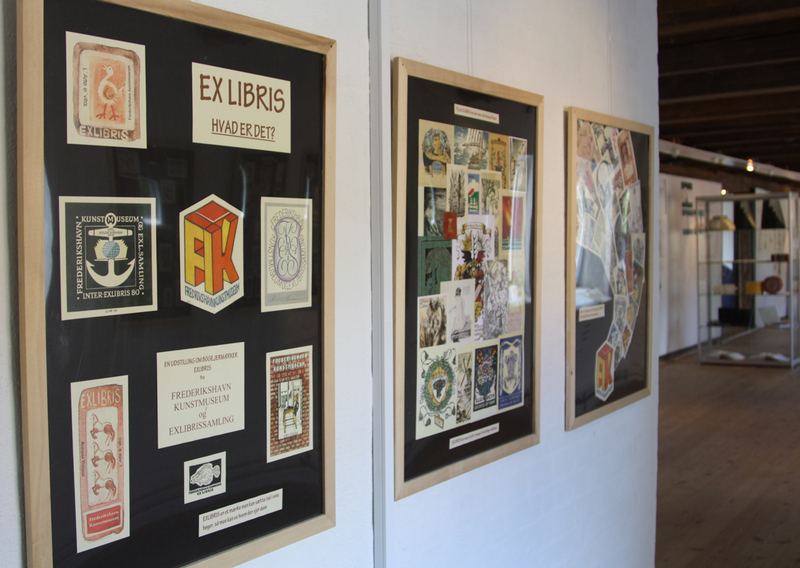 Part of the Ex Libris exhibition in the upper galleries. Photo KEH-J, 2011. Talked about her work and her working process. Everyone enjoying Music in a Garden before the talk. Anne Marie on the left. Photo M-SDA, 2011. 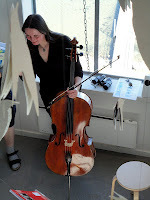 Gave a talk about her residency in Greenland and the work she produced there. Nancy Campbell giving her talk. Photo KEH-J, 2011. 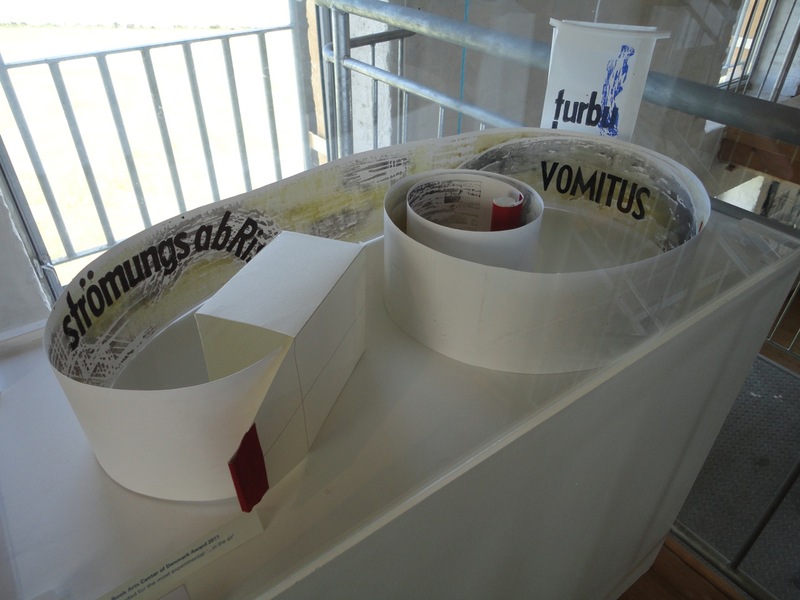 Gave a talk together about their artists' book: Affected as only a human can be. 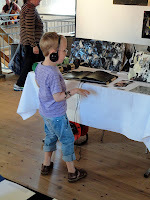 Young boy enjoying work by Litten & Konrad. Photo M-SDA, 2011. 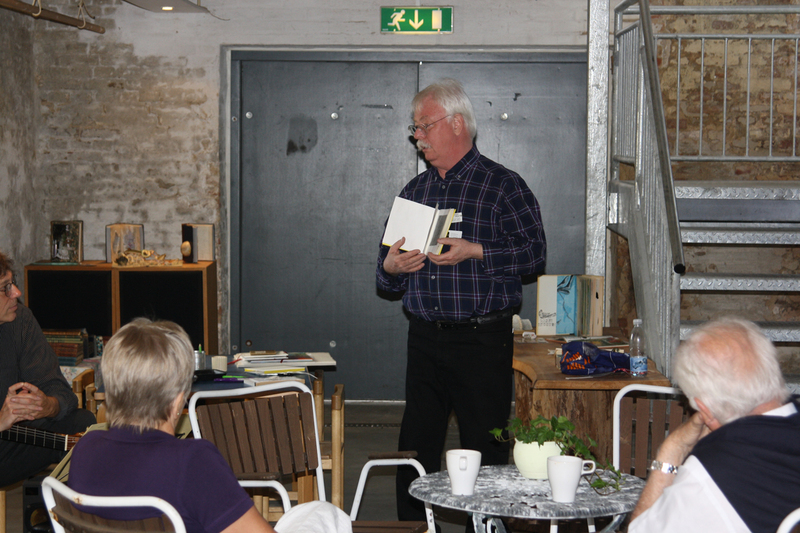 Presented his book: Blown words and talked about his work. Eric Kaare during his talk on the Sunday. Photo KEH-J, 2011. 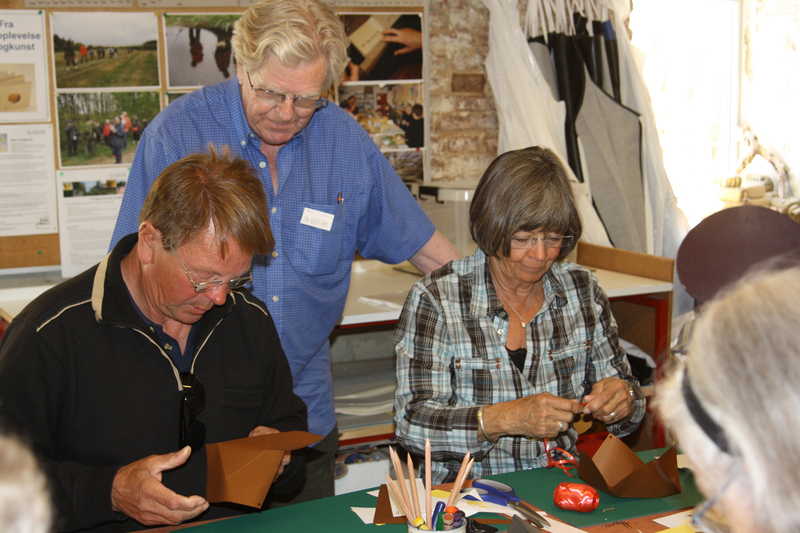 Arne is a retired bookbinder who enjoys making boxes. 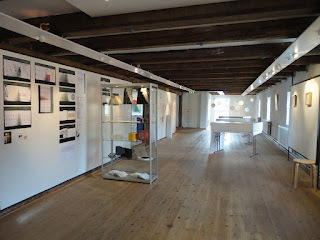 He had his own display of boxes in the foyer of the Limfjordscentret. He gave a talk about his work, which was followed by a workshop in Box-making from single sheets of A4. Arne Holstborg stood up teaching his workshop. Photo KEH-J, 2011. Tommelise & Jeppe Pettersen, Norway – Kit making and flying. Gert Hansen demonstrating his techniques to the group. Photo KEH-J, 2011. 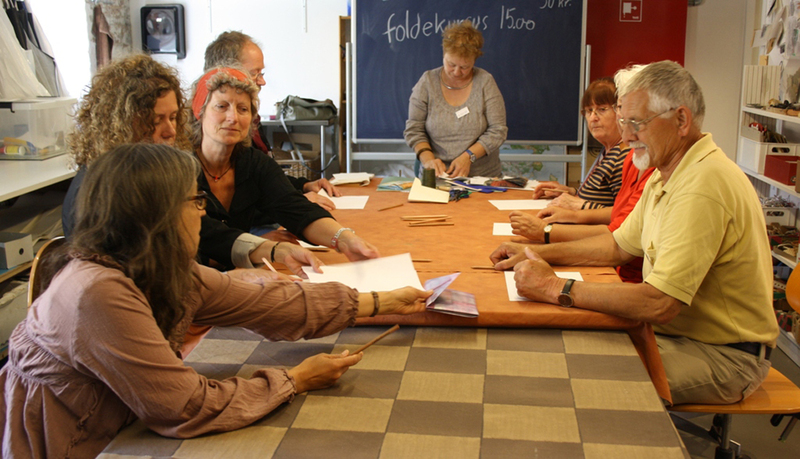 Anne Bossenbroek-Bouchard, Holland – Making of a folded travel book. Anne Bossenbroek-Bouchard stood up during her workshop. Photo KEH-J, 2011. The Festival has over, the years, been the facilitator of new artists networks, one of which is the origami-group which this year got their own work space creating lots of new work in the stand area. 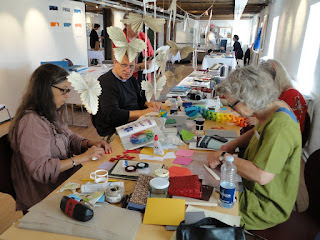 The Origami Group at work. Photo M-SDA, 2011. The Bookbinding class at Holstebro Activity Center had set up their own workshop area for the third year running and were mending old worn books using traditional equipment and demonstrating techniques of the old craft. 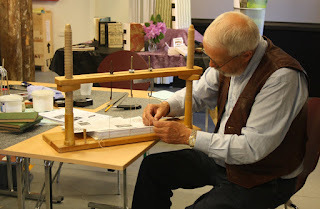 Bookbinder at work sewing a book. Photo KEH-J, 2011. 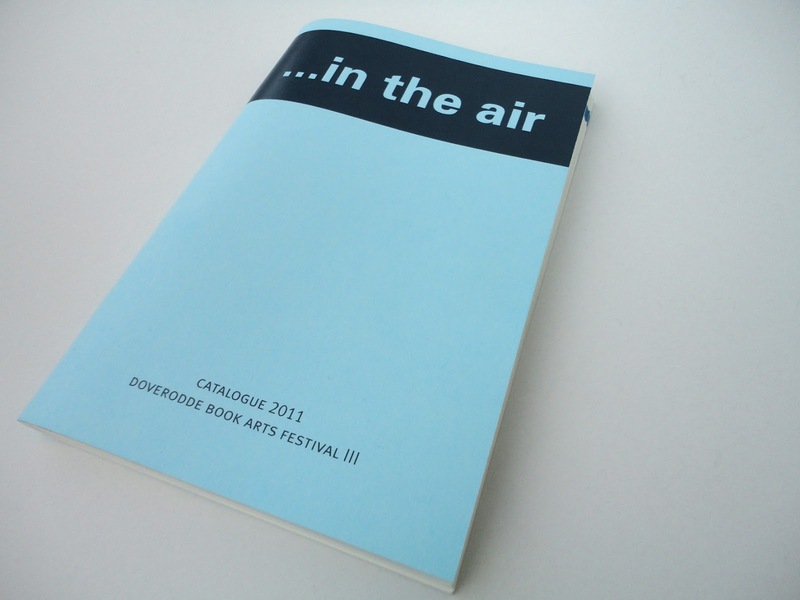 A new initiative to 2011 was establishing the Doverodde Book Arts Center of Denmark Award, which was given to three works in the international themed exhibition: …in the air. The pieces were selected by a jury of professionals with great knowledge and experience in the field of artists’ books. Mette-Sofie D. Ambeck, designer and book artist. 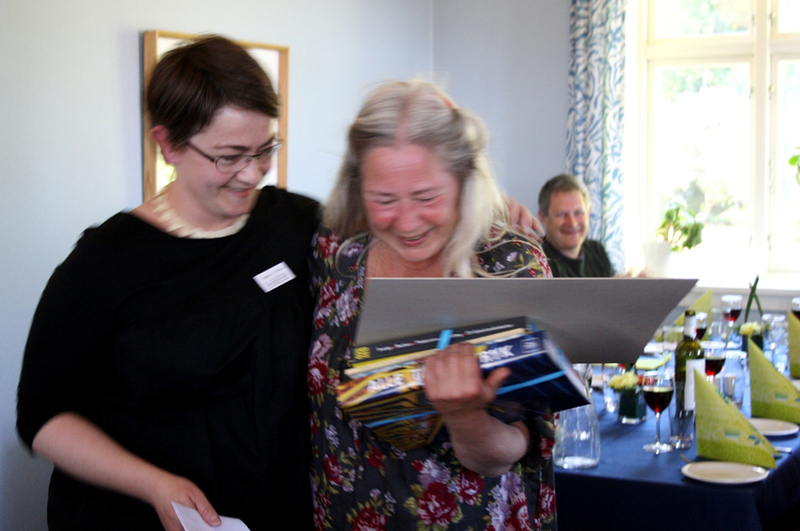 Tommelise being given her prize by Mette-Sofie at the Saturday night dinner-buffet. Photo KEH-J, 2011. 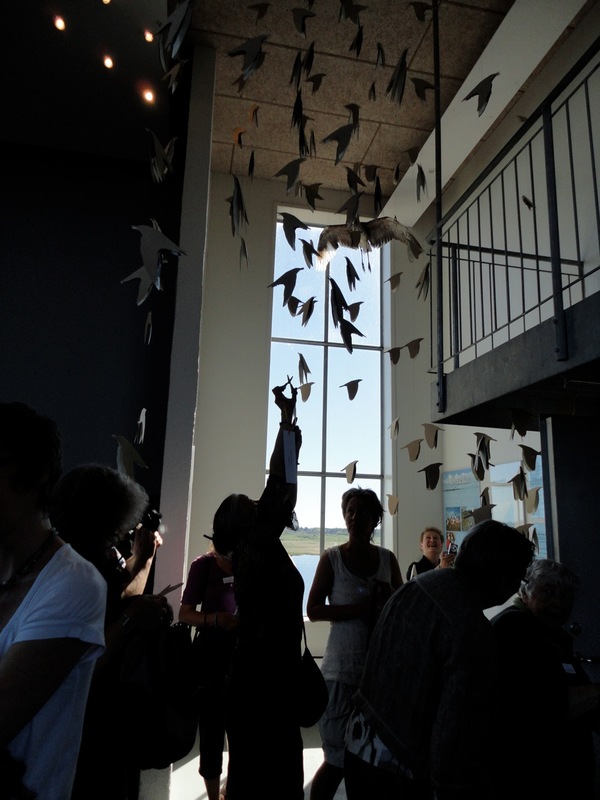 1st prize went to: Tommelise Haldrup Pettersen, Norway (In the air) – best interpretation of the theme. 1st Prize: Tommelise Haldrup Pettersen: In the air. Photo M-SDA, 2011. 2nd Prize: Chisato Tamabayashi: Airborne. Photo M-SDA, 2011. 3rd Prize: Bernd W. Plake: Turbulenzen. Photo M-SDA 2011. All the work from the exhibition: '...in the air' can be seen in the flickr gallery. June 7th-26th, 2011 the Limfjordscentret was host to three special book arts exhibitions by Danish artists from Northern Jutland. In pre-celebration of his 40th anniversary of Nordenvind the show had a small selection of work from both the publishing side of Nordenvind but also pieces from the gallery. He shared the room with artist Anne Marie Johansen with whom he has made several collaborations. A selection of work by Nordenvind. Photo M-SDA, 2011. This exhibition showed several oil paintings by Anne Marie Johansen; some on wood, some on canvas. All with the common theme of taking place in space. Some of the pieces where illustrations to the book: Do angels play football? A book made in collaboration with Eric Kaare and vicar Paul Geil. 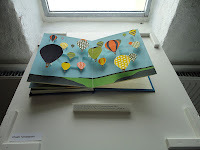 It also had a new book of illustration made especially for the Doverodde Book Arts Festival: Dreaming about blue sunset. 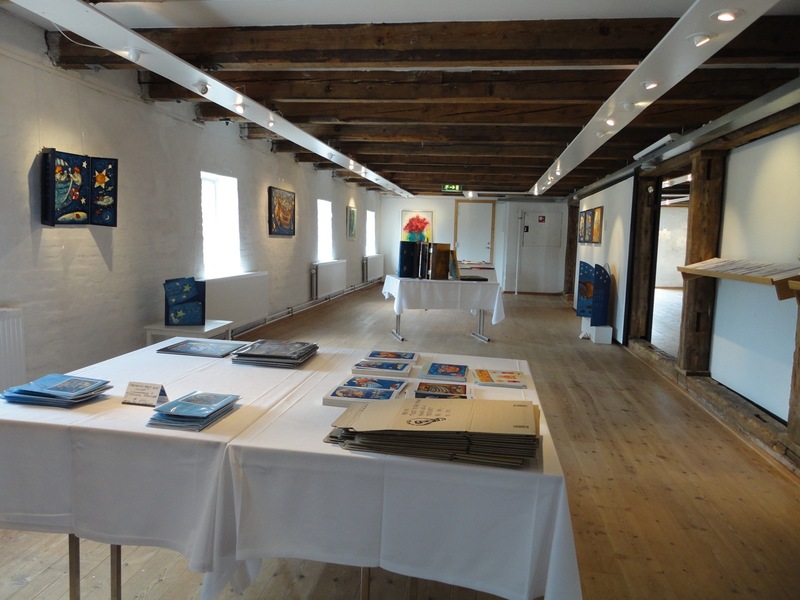 Exhibition by Anne Marie Johansen. Photo M-SDA, 2011. A retrospective exhibition of Mette-Sofie D. Ambeck’s work from the 15-year period 1996-2010. 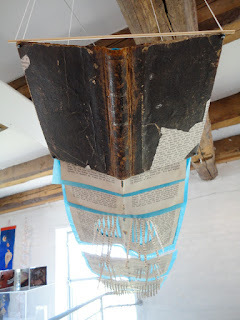 The exhibition showed some of her earlier work, prototypes, sketches and notes for projects and later work including the installation: Cogs – a Book in the Machine (2006). Work by Mette-Sofie D. Ambeck, 2011. Mette-Sofie D. Ambeck, Graphic Designer and book artist designed the catalogue for 2011. Catalogue 2011 by Mette-Sofie D. Ambeck.